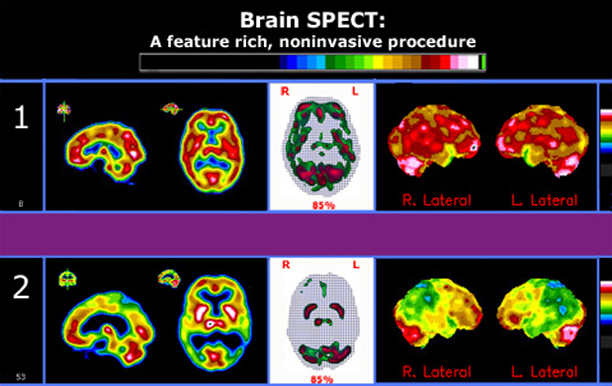 High Definition Brain SPECT is a non-invasive functional imaging procedure for the brain (brain perfusion imaging ). Our optimized equipment and advanced image processing capabilities make it a very effective resource for the evaluation of patients with co-existing and /or treatment resistant Neuropsychiatric conditions. Among the most frequent co-existing conditions evaluated are : Disorders of : Cognition, Mood (Depression, Anxiety) , Development (Autism spectrum, etc.) , Learning, Personality, Behavior ( Oppositional / Defiant ; Impulse control difficulties and other conditions. In addition :ADHD. Traumatic Brain Injury. Non-convulsive Epilepsy. Memory problems. Degenerative brain diseases (differential and followup). OCD. Cerebrovascular disease (chronic stroke). Pain(CRPS). Substance abuse. Effects of chronic Neuro Inflammation. Toxic exposure. Psychosis. A properly done Brain SPECT is a simple, clear, practical and cost-effective way to evaluate Neuropsychiatric conditions with comorbidity (co-existing conditions) and thus contribute to their effective treatment. PathFinder Brain SPECT Imaging at The Neuroscience Center © 2019 All Rights Reserved. The information provided on this page should not be considered medical advice, the information is not intended to replace a one-on–one consultation with a qualified health care professional Seek the advice of a qualified healthcare professional regarding any mental or physical health.